Larry Chilvers with his new bicycle. FARMINGTON - The Farmington Police Benevolent Association offered a helping hand after a collision at Oakes Street and Temple Road last week destroyed a local man's only mode of transportation: his bicycle. Farmington resident Larry Chilvers was reportedly riding his bicycle on the morning of March 31 when he was struck by a passing vehicle. The driver, a 48-year-old Strong woman, told police that she did not see Chilvers crossing the street as she headed north on the Town Farm Road. Chilvers was transported to Franklin Memorial Hospital where he was treated for lacerations on his face, according to Farmington Police Department Chief Jack Peck. No charges were filed as a result of the incident. The bicycle, Chilvers' only mode of transportation, was destroyed in the accident. Chilvers is an employee of Walmart and rides his bike daily to and from work. "We decided as a group to gift him a new one," Peck said. 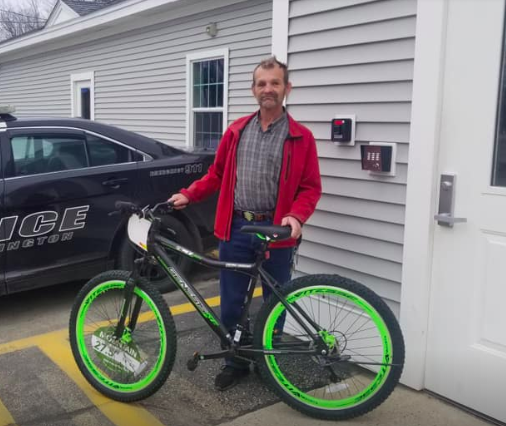 The Farmington Police Benevolent Association bought Chilvers a new bicycle which they gave to him recently, much to his surprise. Such a great act of kindness. You are a good example of giving. Thank you for all you do. Grateful for the police department doing this, but should not have the lady replaced his bike? Seeing how she hit him? What a wonderful thing to do!!! Must have been very much appreciated. Glad Larry is OK. Kudus for the gift of a new bike to the Farmington Police. This incident brings up the safety issue for the need of a walking/bike path on 2&4 from Hannaford to Wilton. Any ideas how this might come about? "Above and beyond the call..." Thanks doesn't even begin to cover this one. Larry is an inspiration to many. Thanks to the Farmington PD for recognizing that. Another example of why this is a great place to live! Thank you Farmington PD. Thanks FPD! Larry is one-of-a-kind, and a very hard-working guy. I'm so happy for Larry that he is alright but also, what a wonderful thing to do for him. Thanks to the FPD for replacing Larry's bike. This was a great thing to do. I will be looking for Larry on this nice green bike that I am sure that he is very thankful for. Thank God he wasn't hurt seriously. He is a familiar sight on Routes 2 & 4. Kudos to the Farmington Police Department. Larry well deserves this new bike, his lifeline. He will be easy to see on that bright green bike.